I always start my day with a fresh cappuccino, and it’s not only because my mother tries out her latte art (which I appreciate even if it is just a letter or smile), but it’s just the pick-me-up I need in the morning. My day starts at 6am and if not for my coffee I don’t know what I would do and how much the people around me would regret me waking up. In truth I am a bit of a ‘grumpa-saurus’ till I get a big mug of cappuccino in my system. 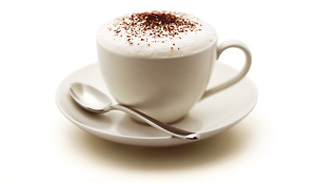 Firstly, cappuccino is an Italian coffee which is served hot. It is traditionally prepared with a shot of espresso, hot milk, and steamed-milk foam. What’s in a name?! Well! This delicious breakfast coffee has an interesting story behind its name. In Italian the coffee has a literal translation of ‘little cap’ which of course describes it perfectly with its steamy foam on top. The name is also inspired by the ‘Capuchin Monks’ who were attired in coffee-coloured hooded robes, and when poured perfectly so that the milk is in a perfect circle around the dark coffee it is known as a ‘monk’s head’. Cappuccino is considered mostly a breakfast beverage as it has the perfect amount of milk and hotness to give you an energy boost to start your day. For us busy people on the move a cappuccino and croissant to go is the perfect combo for a quick breakfast. Cappuccino also provides a stronger boost of coffee as it has less milk than a latte and a luxurious texture. In order to master the art of making the perfect cup of cappuccino you must be attentive and skillful. The most vital part of a cappuccino is getting the accurate ratio of foam that is required. This sits right on top of the coffee, making it the ‘icing on the cake’, or in this case ‘the foam on the coffee’. It must be foamed to velvet perfection. You can learn more about this from ‘Your Guide to Milk Foaming’ at https://kopikatha.com/2014/08/02/your-guide-to-milk-foaming/ . The best way to identify if you’ve got it right is the milky moustache that clings to your upper lip. Achieving the precise ratio of foam requires close attention while steaming the milk, hence making the cappuccino one of the most difficult espresso-based beverages to make correctly, but not impossible. The classical method of making a cuppa cappuccino follows the idea of it being prepared by the combination of 1/3 of espresso, steamed milk and milk foam only. Now you’d probably have heard of an iced coffee – well duh! This is the cold version of a cappuccino! The drink usually has a small amount of cold frothed milk and cubes of ice. Iced cappuccinos also known as ‘Ice Capps’ is another variation. This is a frozen coffee beverage and does not have ice cubes in it like an iced coffee would. It is most popularly blended with cream but can also be drunk with milk. The ice capp can also be prepared as a luxurious beverage including whipped cream and flavours such as caramel and hazelnut. There is also a brownie version made with chocolate milk and mixed bits of brownie topped with whipped cream with more bits of brownie on top. Deee-licious! First, steam one cup of milk in a saucepan over medium heat and let the milk simmer until bubbles form around the edges, but don’t boil the milk completely. Remove the pan from heat and set it down. Thereafter, whip the milk with an electric mixer, increasing the speed as the milk begins to thicken. Continue mixing until you get the desired volume of froth. Now, make the coffee. Measure two tablespoons of grounded coffee into 5ounces of water. Use roasted coffee to give you that fresh coffee taste. You can also brew the coffee in a coffeemaker or a French press. Finally to finish off with the cappuccino get the ratio right. As mentioned the classic cappuccino requires 1/3 espresso, 1/3 steamed milk, and 1/3 foam. Pour the milk on the shot of espresso and top it up with the foam. If you’re feeling adventurous try a bit of latte art in the end when pouring the milk. And just like that you’ve got yourself a lovely cup of fresh coffee and believe me this is worth all the effort. If you have drunk fresh cappuccino and also tried the so-called cappuccino in a pack you will realize the difference in taste and quality. At the end of the day there is nothing like throwing your hair back and relaxing with your favourite coffee. Even though cappuccino is a breakfast drink I believe it has no time. Sometimes I crave it in the middle of the day when I need a boost of energy, or even to relax at the end of the day. Let us know your favourite version of the cappuccino and what coffee you need to help you open those sleepy eyes in the morning?